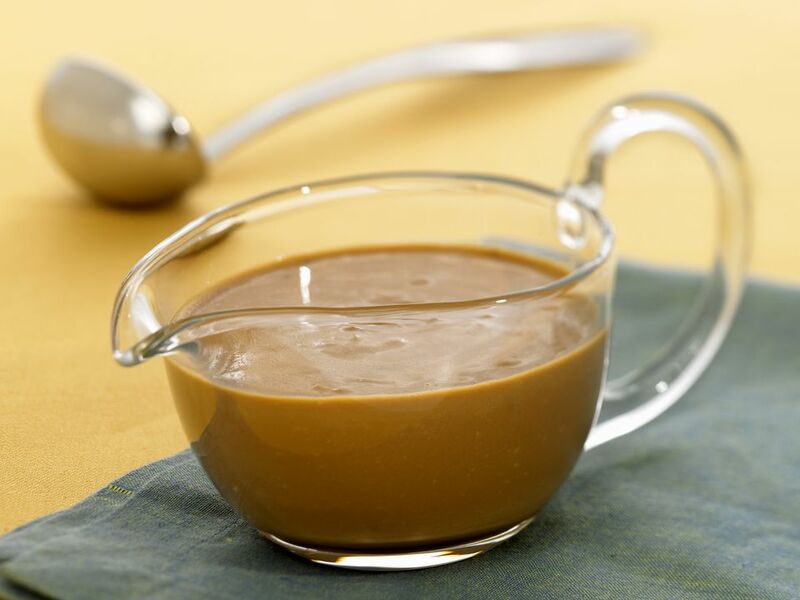 Sauce Robert is a finished brown mustard sauce made with onions, mustard, and white wine simmered in a basic demi-glace. It is an ideal accompaniment for grilled pork and other meat dishes, but you may also enjoy it on roasted vegetables. It is a compound sauce, meaning that it uses a mother sauce as one of its ingredients. But it has an origin that pre-dates (by centuries) Marie-Antoine Carême's classification of sauces in the 1800s. You may pronounce the sauce in different ways, including "ro-BAIR." Sauce Robert rarely appears on restaurant menus today, and it seems many modern chefs aren't familiar with it or prefer to call their brown mustard sauce by a different name. To its credit, the sauce is so delicious that it has evolved very little from its origins centuries ago. You should definitely try it yourself to see what the modern culinary world is missing. Add the wine. Heat until the liquid boils, then lower the heat a bit and continue simmering until the liquid has reduced by two-thirds. Strain through a mesh strainer, add the mustard and the sugar-lemon mixture. Serve right away. Spoon or pour the sauce over your grilled or roasted meat or vegetables. Typical uses are on pork or lamb. Variations of Robert sauce include adding some peppercorns, bay leaves, or fresh thyme. You can use your own homemade demi-glace or save yourself a lot of work and buy demi-glace already made. Demi-glace itself starts with espagnole sauce (brown sauce) as its mother sauce. The primary ingredient in espagnole sauce is beef stock. That takes lots of time roast the bones, simmer, season, and reduce. But if you have the time, it can be very rewarding. The sauce has origins at least as far back as the early 14th century, making it one of the oldest classic sauces. Sauce Robert is mentioned in a manuscript by Guillame Tirel (known as Taillevant). He was a master chef at the French court who wrote "Le Viandier," one of the earliest recipe collections of the Middle Ages. The sauce later was ascribed to a 17th-century cook named Robert Vinot, which may be where it picked up its name. This version is closest to that which appears in Auguste Escoffier's "The Complete Guide to the Art of Modern Cookery" and in recent editions of "Larousse Gastronomique."